Interested in joining the team or helping out? Speak to Steve Foteff today!!! The service costs approximately $13 million per year We undertake approximately 1200 missions per year Since the Service's inception in 1975 no one has ever paid to be transported • 60% of the Service's funding is provided by the community through one off and ongoing donations, payroll deductions, event attendance, supporting our volunteers, and our money tins within the community Your support allows us to attend to various missions ranging from transporting a critically injured patient from a motor vehicle accident to a new born baby requiring life saving intervention. Please Note: The WRHS is a registered charity and all donations over $2.00 are tax deductible. Today we welcome Valentine players, officials, supporters, and sponsors to Magic Park. After finishing bottom of the table in 2018, Darren Sills and Sam Griffin had little option but to go on a recruitment drive that saw Brock Oakley, Ben Hay, Jordan Harrison, Bailey Garland and Jacob Bailey join the club. The season started brightly for Valentine with a win verses Adamstown in Round 1 followed by a draw against second placed Weston a week later. However, things came undone last weekend with a crushing 4 – 0 loss against one of the premiership favourites Lambton Jaffas. The strength and unpredictability of the competition has came to light over the last two weeks with Adamstown cruising past Charlestown 3 -1, Valentine holding Weston one all and Lakes narrowly going down to a strong Jets side 1 – 0. No team can take another lightly. 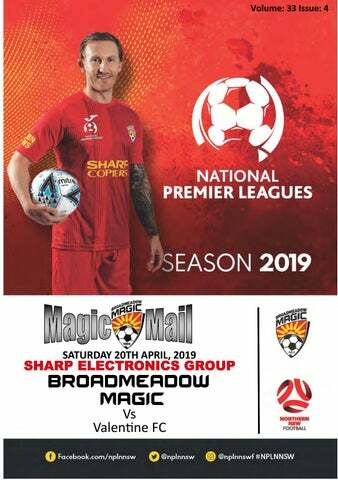 Magic after a diabolical start to the season have bounced back with wins verses Hamilton and Adamstown and a stalemate one all draw against Maitland. It is great to see Alex Kantarovski training strong, we cannot wait to see him in his number 6 shirt after so long on the sidelines. In other injury news, punters will notice Magic gaffer Ruben with crutches, after showing the Magicians how its done during a drill he injured his ankle. In trademark Ruben fashion, he finished the drill then walked off, he hasn't done much walking since, finding out he detached his ankle ligaments off the bone. Good luck to both sides and irrespective of result today Broadmeadow Magic Football Club would like to extend an invitation to all Valentine players, officials, supporters and sponsors to join us at “The Duke Hotel” Regent Street, New Lambton for the after match presentations. EVEN THE G.O.A.T. HAS HIS MAGIC PLANNER... 2019 Planners Available from the Canteen in massive A2 Size!!! Broadmeadow Magic is in the process of finalising guest speakers for our 2019 Magic Long Lunch, so SAVE THE DATE!!! Venue– Magic Park– Home Game versus Lambton Jaffas FC Date– Friday 12th July. The Charity Shield is coming up soon, and Steve from Elder Real Estate has been busy collecting donation and raffle prizes for our annual Charity Shield in aid of the Westpac Rescue Helicopter Service, so SAVE THE DATE!!! Venue– Duke of Wellington Hotel, New Lambton Date– Sunday 12th May. Broadmeadow Magic is delighted to announce that the outer ground lighting project proceeded towards the installation stage this week. With the foundations for the 4 new poles laid, we hope the weather holds out for a speedy installation. If walking around the outer ground, please take care around the construction zone. Not moving like you used to? Got a niggle? Then give Next-Gen Physio a call. At Next-Gen Physio you will experience quality one-on-one physiotherapy services and a commitment to maintaining your goals through accessing our expertise and the most current fitness equipment in the industry. Home Team Broadmeadow Magic Charlestown Broadmeadow Magic Adamstown Broadmeadow Magic Edgeworth Sun. Sun. Sun. Sun. Sat. Sat. Sat. Sun. Sat. Sun. Sun. Sat. Sun. Sat. Sun. Sat. Sun. Sun. 21 Apr. 28 Apr. 5 May 12 May 18 May 25 May 1 Jun. 16 Jun. 22 Jun. 30 Jun. 7 Jul. 13 Jul. 21 Jul. 27 Jul. 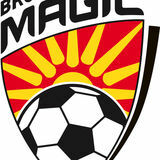 4 Aug. 10 Aug. 18 Aug. 25 Aug.
Broadmeadow Magic v Maitland Sat. Sat. Sun. Sat. Sun. Sun. Sat. Sat. Sat. Sun. Sun. Sun. Sat. Sat. Sat. 20 Apr. 27 Apr. 12 May 18 May 26 May 2 Jun. 15 Jun. 22 Jun. 29 Jun. 7 Jul. 21 Jul. 28 Jul. 3 Aug. 17 Aug. 24 Aug.